Girl Missing Tooth, a Norman Rockwell painting , appeared on the cover of The Saturday Evening Post published September 7, 1957. This is another timeless favorite of Rockwell collectors, a classic for all the ages. An alternate title for this painting is The Checkup. This painting was Rockwell's 297th overall out of 322 total paintings that were published on the cover of the Saturday Evening Post. Rockwell's career with the Post spanned 47 years, from his first cover illustration, Boy With Baby Carriage in 1916 to his last, Portrait of John F. Kennedy, in 1963. This was also the fourth cover for The Post in 1957. 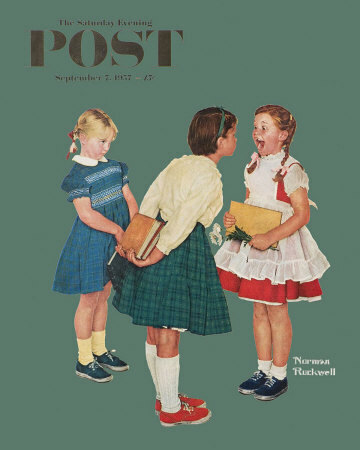 In 1957, there were five Norman Rockwell Saturday Evening Post covers published. The original oil on canvas painting, 29 x 27 inches or 73.5 x 68.5 cm, is part of a private collection. Thge original painting brought $1,385,000 at auction on November 28, 2007 at Sotheby's in New York City. The sale price exceeded the pre-auction estimate of $800,000 to $1,200,000. on page 214 of Norman Rockwell, A Definitive Catalogue by Laurie Norton Moffatt. One study also appears in the Norman Rockwell Catalogue on page 214. In this painting, Norman Rockwell shows us a childhood rite of passage. We all lose our baby teeth. Some of us loose our permanent teeth as well, but this painting does not get that far. It looks like this little girl has lost both of her two front teeth. Her uppers, that is. Lowers are not quite as prominent and visible when missing. I hope that she was visited by the tooth fairy. Either way, she seems to be making the most of her missing teeth. One of her schoolyard friends seems interested in her smile. Her other classmate seems unsure whether she wants a close look or not.. Girl Missing Tooth was only one of 322 Norman Rockwell Saturday Evening Post covers; Here is the list of Norman Rockwell Saturday Evening Post cover illustrations. Rockwell was inspired tor this painting while he was painting a series of ads for Crest Toothpaste. Anne Morgan, now Anne Morgan Baker, the daughter of some of Rockwell's friends, showed up for her Crest portrait missing her two front teeth. It was no problem for the artist to paint her front teeth in place for the ad. But her smile made him think. This painting is the result of that encounter. Do You Have A Great Story, Opinion Or Contribution About Girl Missing Tooth?